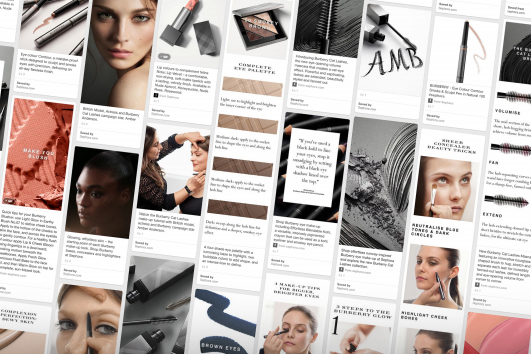 Burberry has become the first fashion brand to create a personalised experience for customers on Pinterest, the picture-sharing platform, with customised make-up boards. The partnership, which coincides with the launch of Burberry Cat Lashes Mascara, uses the Pinterest API to enable customers to receive personalised and monogrammed content based on their make-up preferences. To promote the experience, Burberry and make-up retailer Sephora are pushing out social media posts and Pinterest Promoted Pins, which invite people to sign up after completing a questionnaire. The results from the questionnaire are then used to create a personalised board. Pinterest claims to be the largest beauty platform in the world with more than 38.5 million monthly unique viewers of its hair and beauty category. According to an internal study, it also claims 42% of pinners have made a beauty purchase after viewing a pin. Last month Burberry announced it would replace Christopher Bailey as chief executive after the company plummeted in value. Bailey, who takes on a new role as president as well as remaining chief creative officer, will be replaced next year by Marco Gobbetti, the chairman and chief executive of LVMH-owned Celine.